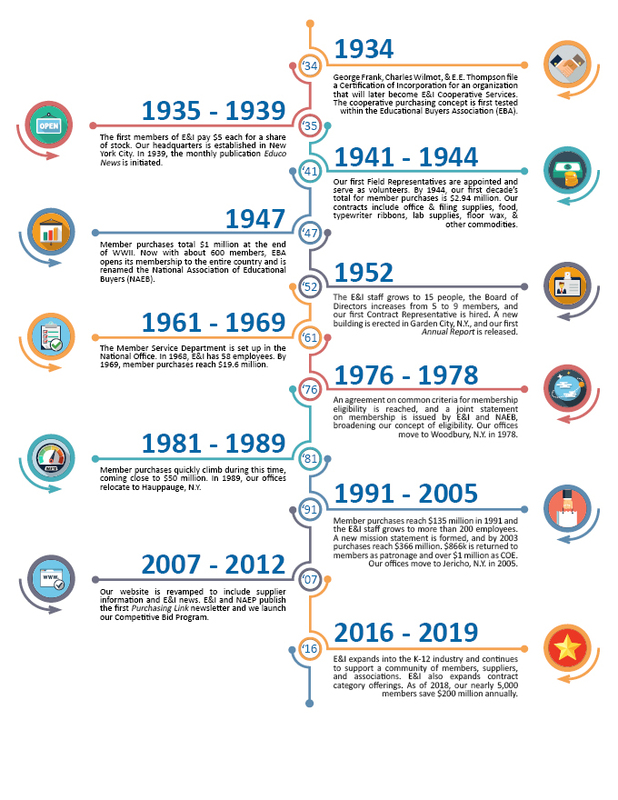 The history of E&I spans more than 80 years. On August 2, 1934, three innovative gentlemen joined together to file a Certificate of Incorporation on behalf of a new organization. This would become the Educational and Institutional Cooperative Service. George Frank, Manager of Purchases at Cornell University, Charles Wilmot, Purchasing Agent at Colgate University, and E.E. Thompson, Purchasing Agent at Syracuse University had no idea that they were creating what would one day become the premier purchasing organization for education. More than 80 years later, the legacy of these three thought leaders remains at the core of everything we do. E&I’s member-driven approach has always been the core of our success. We’ve come a long way since 1934. This is thanks in part to the visionary leaders who have advanced the Cooperative’s mission through the decades. We look forward to seeing what the future holds!